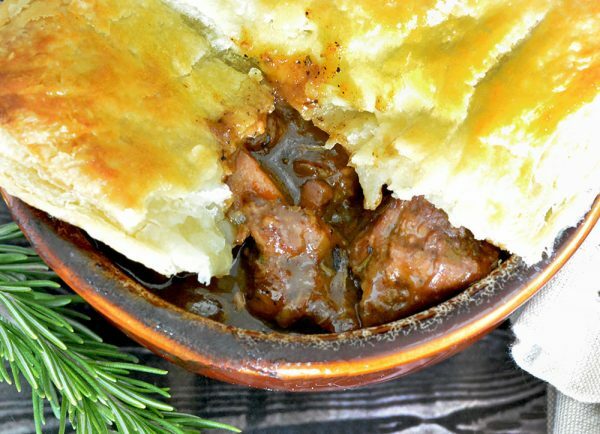 This hearty steak and ale pie recipe features tender steak, thick and robust gravy and light pastry. You’ll want to serve this again and again. 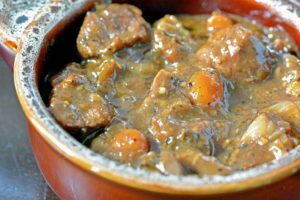 With St. Patrick’s Day coming up, we wanted to share with you one of our favorite recipes: Steak and Ale Pie. This Steak and Ale Meat Pie Recipe is full of robust gravy, tender steak, light pastry and dark beer. All it’s missing is a little green leprechaun. One bite of this gravy goodness and you’ll wish St. Patrick’s Day occurred more than once a year. 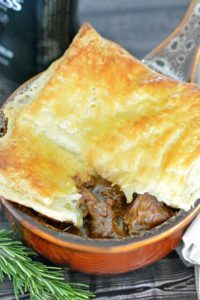 Among all the dinner recipes or steak recipes we’ve featured here at FoodieandWine, this Steak and Ale Pie is tied for our favorite alongside our Shepard’s Pie. They’ve been in the rotation for years and haven’t been kicked off their very high pedestal. For very good reason. They satisfy even the largest appetite and pickiest palates. 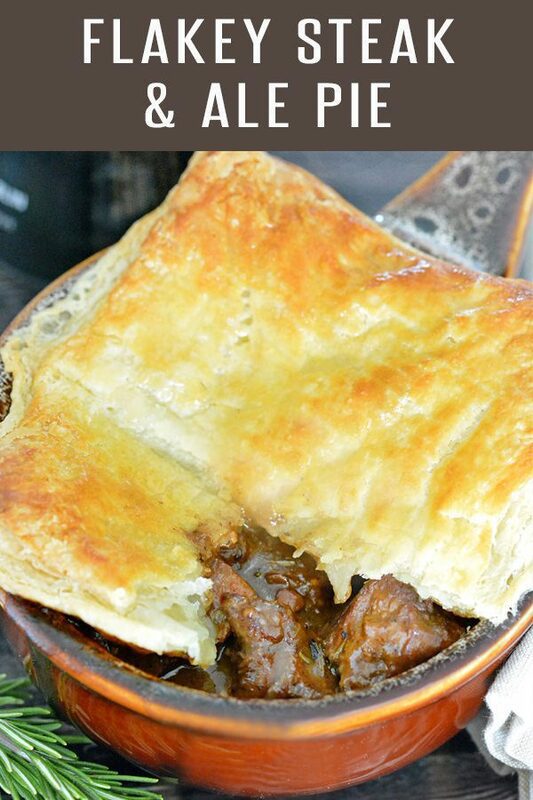 This Steak and Ale Pie Recipe calls for a good robust stout or ale. We always use classic Guinness, but don’t let that limit your decision. If there is a particular dark stout or ale you prefer or already have on hand, have at it. We know. We know. This is called “ale” pie. We just prefer a non-bitter stout like Guinness. Step 1 – Take a fatty swig to make sure the “product” is up to snuff. Step 2 – Set aside the listed amount called for in the recipe. Step 3 – Take another fatty swig just to make sure you weren’t wrong the first time. Step 4 – Repeat Steps 1-3 as needed. Yep. Makes cooking MUCH more fun. Don’t drink beer? This recipe calls for 1.5 cups so maybe this isn’t the right recipe for you. As they say “it’s not you, it’s me.” Do note…you won’t be able to taste the beer in the end product, but I know how “touchy” some palates are. Standard Steak an Ale Meat Pie calls for a mixture of vinegar and brown gravy. A lot of recipes we’ve seen online the past couple of years don’t call for vinegar which is a bit puzzling. The vinegar adds that little bit of acid required to make the gravy complex and your loved ones instinctively say “mmmm” after the first bite. TRUST. You want to keep it in. Don’t have time to spend 3 hours in the kitchen today? Make it the day before and refrigerate. When you’re ready to enjoy just pop it in the oven for 30 minutes to reheat. Then skip ahead to the step in which you add the puff pastry. Now Swig and Repeat Away! This hearty steak and ale meat pie recipe features tender steak, thick and robust gravy and light pastry. You'll want to serve this again and again. In a large bowl mix the flour and garlic powder. Set aside. Cut the roast into 1.5" - 2" cubes. Place the beef into the flour mixture and toss to coat evenly. Place a dutch oven (or large pan) over high heat. Once heated, add 1 tablespoon of butter and let melt to coat the bottom of the pan. Add the beef to the hot pan and sear on each site until crispy (about two minutes per side). Place the seared beef on a dinner plate and set aside. Reduce the temperature to medium and add 1 tablespoon of butter followed by the onion and carrots. Cook for about 5 minutes until the carrots and onions are soft. Add 1/2 cup of beer to deglaze the pan. Make sure to scrape the bottom with a wooden spoon. If necessary, add another 1/2 cup (if the original amt. cooks off quickly). Let cook for 2 minutes. Stir in the Worcestershire Sauce, balsamic vinegar, tomato sauce, sugar, rosemary, bay leaf and thyme. Add in the last cup of beer, beef broth, salt and black pepper and stir. 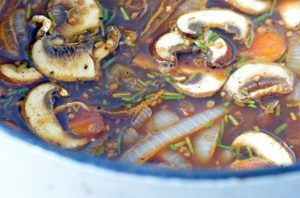 Add in the mushrooms and seared beef and stir. Place the dutch oven in the oven and bake for 90 minutes (covered). When done baking, mix the cornstarch with a tablespoon of water and add to the beef mixture. Set aside for 5 minutes to thicken. Transfer the beef mixture to a pie dish or other deep dish container. Unfold the puff pastry and lay flat. Beat the egg with a tablespoon of water and brush lightly across the puff pastry. Place the puff pastry on top of the pie dish and, using a knife, poke a hole or two in the top (to allow air to escape). Transfer the pie to the oven and bake for another 20-25 minutes until golden brown. Remove from the oven and let sit 5 minutes before serving. This looks amazing. I’ll have to try this out. I love steak. My husband was just talking to me the other day about wanting to make something like this! I’ll be showing him your recipe. This looks so fresh and delicious. I love a great meat pie. Yum! This food looks delish. Thank you for sharing the recipe. I LOVE eating steak. Ah, I agree, that kind of dish does satisfy most anyone. I know it would be a big hit here. This looks so hearty, healthy, and tasty. I love meat pies especially homemade though I have not had any in so long. I will have to make one soon. That looks so good. The gravy looks packed with awesome flavor as well. It’s really great to serve this with ale, otherwise the meal wouldn’t be complete. That looks amazing! My mouth is watering, I just ate dinner but I want this right now! It is exactly the kind of tasty and hearty dinner my husband likes and if I were to be honest, I like too. Thanks for the recipe. I’m gonna be honest here. I can’t cook that. I just don’t have the talent for it. I think I’m just gonna go ahead and order that coz it looks really good. Yum! This looks really good and even though we aren’t drinkers I still think it would be worth trying! Oh wow! i will ask my husband to make this for me <3 yuuuummy! Oh, I think my father would love this. I will certainly make this for him.